Newark, DE - As a prelude to the 2012 Rocky's Reading Challenge, Blue Rocks mascot Rocky Bluewinkle surprised the kindergarten through fourth grade students at Holy Angels School in Newark. Rocky entertained the children by acting out his favorite story, "Rocky at the Bat", a varied rendition from the original story, "Casey at the Bat" by Ernest Lawrence Thayer. Rocky surprised the students because he was assisting his friend, Hannah Zimmerman, who was working on the completion of her Gold Award project, sponsored by the Girl Scout Council. Her Read-A-Thon project included creating both a bulletin board in the hallway and a reading corner in the library at Holy Angels School. To cap off the project, Zimmerman designed a program similar to Rocky's Reading Challenge, where kids need to read a minimum of 10 books over a four-week period. Zimmerman is currently a sophomore at Saint Mark's High School in Newark and is an alumna of the Holy Angels School. Information will be coming soon regarding the 2012 Rocky's Reading Challenge and school visitation. We look forward to having each and every school participate this year. For more information on the program, e-mail communityrelations@bluerocks.com. 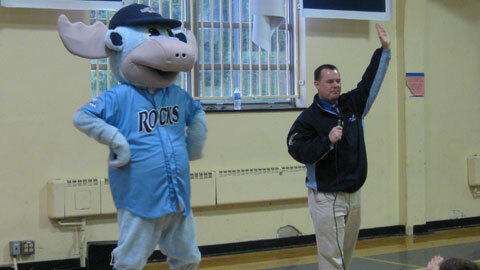 For 2012 Blue Rocks ticket information, please call 302-888-BLUE or visit bluerocks.com. Season tickets are on sale now. CLICK HERE for more information on season tickets. CLICK HERE to view a PDF of the Blue Rocks' 2012 schedule.